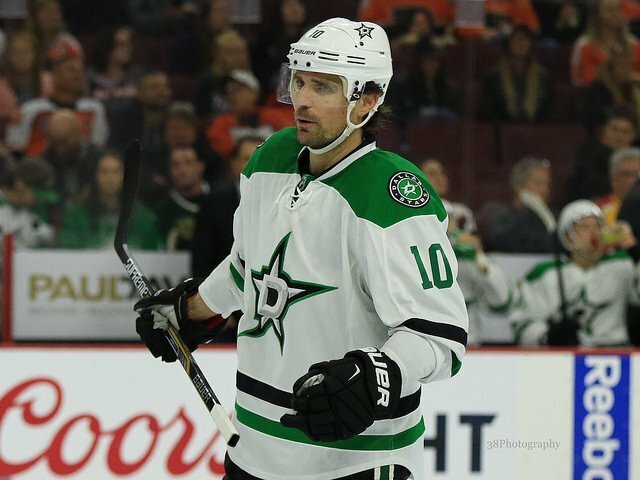 In the third annual “Jim Nill Summer Robbery” series, we saw the Dallas Stars land Patrick Sharp in a trade involving Ryan Garbutt and Trevor Daley. Sharp enjoyed many years of success with the Chicago Blackhawks but they were forced to trade him in order to free up cap space to sign Brandon Saad Johnny Oduya Marcus Kruger. Why did the Stars spring for the sniper while offense clearly wasn’t an issue? For starters, the Stars had some big question marks heading into the season in terms of their top six. Obviously Jamie Benn, Tyler Seguin and Jason Spezza were locks but that is only half of the top six. It was and still is unclear whether Val Nichushkin is ready for it full-time. Ales Hemsky has looked good coming off of hip surgery but hasn’t impressed enough to be engraved in the top-two lines. They have had players such as Patrick Eaves and Rich Peverley plug top-six holes in the past but they lacked the ability to be a finisher next to some of the skill players. Sharp solves a big part of that. Veteran leadership is helpful for a young team without a lot of playoff experience but what Sharp really adds is a defensive responsibility that needs to rub off on the rest of the team. Game in and game out this season, the Stars have seen Sharp back-check with ferocity and turn the puck the other way. He works hard turning defense into offense which is the mentality that is going to lead the Stars to having a successful season. His offense started slow in a Dallas uniform but he remained patient and is beginning to catch fire. Brent Burns had this puck and would have likely turned the play into a prime scoring opportunity for the Sharks early in the game. Sharp snags it with a quick stick lift and turns the play the other way, eventually cashing in on a rebound. He has had many takeaways that have led directly into scoring chances in just 11 games so far with the Stars after doing it for years in Chicago. I’m sure Blackhawk fans remember this one and it is one of my favorite hockey plays to watch. It started slow, but his play with the puck is starting to pay off. Sharp has four goals and five points in his last three games, including the tying goal in the third period against Vancouver last Thursday night. Despite the slow start, Sharp now has 8 points in 11 games and the flood gates appear to have opened for him. Many saw this coming as Sharp had been creating a ton of scoring chances even when he wasn’t cashing in. Only Seguin and Benn have more high-danger scoring chances on the Stars than Sharp does this year as he has been responsible for 14 of those opportunities. He has 38 total individual scoring chances, good for second on the team behind Seguin. It is likely that the goals will keep coming for Sharp as long as he keeps creating opportunities as his even-strength PDO is near the bottom on the team. His even-strength numbers have been solid so far, as he has posted a 54.37 corsi-for-% and a 52.68 fenwick-for-%. All four of Sharp’s assist have been the primary assist, good for second on the team in that category. He has been excellent in creating quality opportunities for both himself and his teammates and the points should keep piling up. Expectations for the Stars and Sharp were high heading into the season and there hasn’t been a big reason to temper those expectations so far. Sharp has been as-advertised, great in his own end and not afraid to shoot the puck. With the early pace he is on and the amount of chances he is getting on a nightly basis, it isn’t crazy to expect a potential 25-goal, 60-point season for Sharp. Even if the production doesn’t reach those levels, his play in his own end should have an excellent impact on the team as a whole. The Stars are 9-2-0 because they are getting back-checking help from their forwards and they all have been great at breaking up plays and turning them the other way. Mattias Janmark and Radek Faksa are two players that come to mind in that regard, as both are forcing a ton of turnovers and turning them into offensive chances. As long as that type of play continues, the offense will figure itself out and Sharp will have a successful season down in Dallas.